From the award-winning American playwright Tennessee Williams comes the amazing play A Streetcar Named Desire. 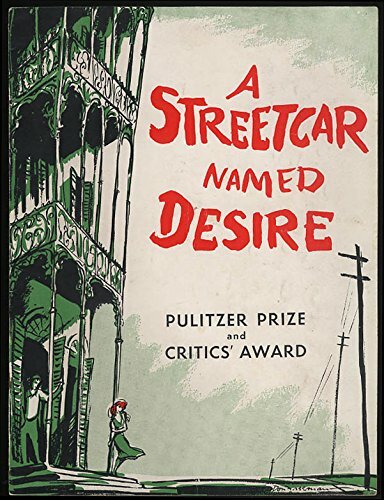 Williams published A Streetcar Named Desire in 1947, and in 1948 it won the Pulitzer Prize for Drama. This classic play showcases the life of Blanche DuBois and how her past actions ultimately led to the destruction of her happiness. Grief and sorrow change people in many ways, and that is demonstrated with Blanche in A Streetcar Named Desire. Blanche is an older southern woman, who has done unspeakable things to try to forget the pain of losing her husband. Those unspeakable things cost her, her job, home, and happiness. Knowing she couldn’t continue to live that way, she goes to visit her sister Stella, in New Orleans. While in New Orleans, Blanche is critical of everything from the men to the houses, because they aren’t as high class as she would like. She is also shocked and worried about the way that Stella lives, because of the way her husband, Stanley treats her. Eventually, Blanche finds happiness in the form of a relationship, but thanks to Stanley, her past comes back to haunt her and once again her happiness is shattered. I discovered A Streetcar Named Desire, in AP Literature when my teacher gave us a list of novels and plays to choose from for our six weeks project. She said that A Streetcar Named Desire, was a good play, so I chose to read it, and I loved it. I really like how the plot and dialogue of the play are easy to follow and understand. Sometimes plays become hard to follow because so much is going on, but not this one. Another thing that I like about this play is how each of the characters has different personalities and different qualities. It made it easy to love, hate, and sympathize with them. I also love how the play never has a dull moment. It was like reading a really interesting soap opera, that keeps readers hooked from start to finish. I loved this play so much that I couldn’t stop reading it. I absolutely enjoyed reading A Streetcar Named Desire, and I recommend that everyone read it at least once. If you enjoy drama, realism or soap opera style plays, then this is the play to read. If you’re interested in purchasing A Streetcar Named Desire, it is available at Barnes and Noble or on Amazon.